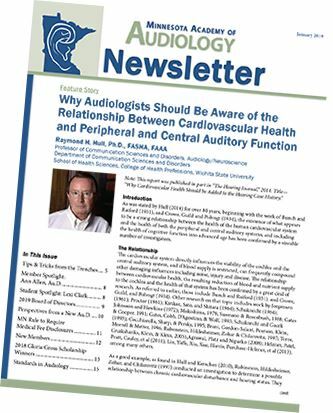 Welcome to the official website of the Minnesota Academy of Audiology. We are a trade association devoted to promoting high standards of care for people with HEARING AND BALANCE PROBLEMS and supporting the PROFESSIONAL AUDIOLOGISTS that care for them. The Minnesota Academy of Audiology (MAA) members are professional audiologists who are university-trained and licensed to practice within the state. We specialize in the evaluation and treatment of people with hearing loss, tinnitus (ringing in the ears), dizziness, and balance problems. We treat adults, infants and children of all ages. Our patients can count on us for all of the solutions to their hearing and balance problems. Your membership in MAA serves to promote and support the development of the profession of Audiology, by spreading awareness to the public and advocacy for those with hearing loss and balance disorders in Minnesota. Membership also brings personal development, with discounted registration for our annual Upper Midwest Audiology Conference, members-only access to our quarterly newsletter, and invitations to multiple events and opportunities to network with fellow audiologists in our state. Volunteer members work to provide you with information about coding and reimbursement changes, governmental relations updates, lobbying efforts, and other grassroots efforts which serve to elevate and bolster our profession. Click the link below to learn more about joining or renewing your membership. Click here to search our membership directory. Click here to register for membership.